Kazuki Yamada is Principal Guest Conductor of Orchestre de la Suisse Romande, an appointment which followed his sensational debut with the orchestra in June 2010, one of his first appearances in Europe. In 2009, he was the winner of the 51st Besancon International Competition for young conductors, receiving the Audience Award as well as the Grand Prize. Now rapidly establishing a name for himself on the international scene, Yamada is appearing with such orchestras as Orchestre de Paris, Philharmonia Orchestra, WDR Sinfonieorchester Köln, Rundfunk Sinfonieorchester Berlin, St Petersburg Philharmonic, Czech Philharmonic, City of Birmingham Symphony and Gothenburg Symphony. In Japan, he holds the positions of Principal Conductor of Japan Philharmonic, Music Partner with Sendai Philharmonic and Ensemble Orchestral Kanzawa and Music Director of Yokohama Sinfonietta, an ensemble he founded whilst still a student. Strongly supported by Seiji Ozawa, in August 2012 he conducted Xenakis’ opera ‘Oresteia’ with Tokyo Sinfonietta, as well as a televised semi-staged production of Honegger’s ‘Jeanne d´Arc au bûcher’, with Saito-Kinen Orchestra. Having made several impressive debuts over the last two seasons, Yamada returns in the 13/14 season to such orchestras as Royal Stockholm Philharmonic, City of Birmingham Symphony, Orchestre Philharmonique du Capitole de Toulouse and Orchestre de Chambre de Lausanne. Notable debuts include Orquesta Sinfonica y Coro de RTVE, Malaysian Philharmonic Orchestra and his Vienna debut with Tonkünstler-Orchester at the Musikverein. Yamada will conclude the season with an extensive tour to Japan and the Far East, with Orchestre de la Suisse Romande. Soloists with whom he is working include Emmanuel Ax, Boris Berezovsky, Gautier Capuçon, Leon Fleischer, Håkan Hardenberger, Nobuko Imai, Daishin Kashimoto, Daniel Müller-Schott, Xavier de Maistre, Steven Osborne, Vadim Repin, Fazil Say, Baiba Skride, Jean-Yves Thibaudet and Daniil Trifonov. 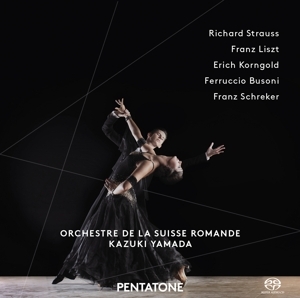 Over 2013-2015, Kazuki Yamada and Orchestre de la Suisse Romande will release a series of 3 CDs inspired by dance music, on the Pentatone label. Furthermore, a disc of works by Glazunov, Kalinnikov and Khatchaturian with Czech Philharmonic is due for release with Octavia Records during the 13/14 season. Passionate about choral repertoire, Yamada is Tokyo Philharmonic Chorus’s Residential Conductor and the group have released four CDs (on Fontec). Now resident in Berlin, Yamada was born in Kanagawa, Japan, in 1979. He was awarded the Ataka-Prize in 2001 when he graduated from the conducting course at Tokyo National University of Fine Arts & Music. He also studied under Gerhard Markson at the Mozarteum Salzburg in 2002. In 2011 he received the Idemitsu Music Prize for young artists in Japan.